Thank you to everyone who helped us to send warm blankets and clothes to those in need at home and abroad. 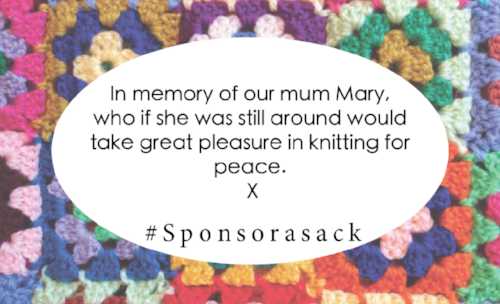 The need is great so please sponsor a sack for just £12. Provide warm clothes to those in need, help women set up knitting cooperatives to provide a livelihood, enable women in refugee camps to knit for themselves and others. Lots of ways to keep the world knitting. Click here to view all our knitterly gifts in the new Good Gifts Catalogue. We have a wonderful new range of Christmas cards for 2018, in aid of Knit for Peace. To see the complete selection visit Card Aid’s website. We are always in need of adult scarves, mittens and jumpers and there is always demand for large blankets. We don’t need neo-natal items at the moment and we have plenty of children hats. “I am proud to send you a parcel with items knitted by our members here at the Beehive. There is one space left for our October knitting holiday in India led by Ann Kingstone. Don’t miss your chance and book your space here. see our work and the Knitting Room.